The statistics suggest an average teen spends up to three hours a day on social media platforms whether or their smartphones or desktops and the average adult spends almost two hours every day going online via desktop or laptop. In the advent of the technological revolution, people now spend more time checking out the internet each morning than they do with morning chores. The internet and social media are definitely the gamechangers that has changed the face of the online ecosystem. Internet fixation is fueling a different kind of addiction in this digital era. As much as the internet makes everything so easily accessible, it also leaves you vulnerable to online security risks. It’s true that internet has become more than a necessity in our day-to-day life, but it’s equally dangerous. The internet offers many social benefits, but not without its fair share of risks involved. Because the internet connects millions of computers globally to create a massive network, it can be a dangerous place. It poses risks to not only the host computer but also the computers that are connected to it, which makes it all the more important to protect your network from malicious mischief. This is where a firewall comes to the picture. A firewall is a hardware-based security system designed to safeguard your personal computer and private network from both incoming and outgoing traffic. It is designed to protect both public and private networks from unknown threats. In simple terms, a firewall acts as a barrier between your network and the internet. It monitors the incoming and outgoing traffic for potential breach in order to prevent unauthorized access. It analyzes the data packets sent based on a pre-defined set or rules and decides which one should go through and which one should be restricted. 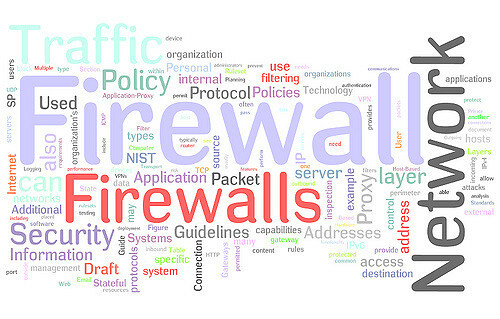 The main purpose of a firewall is to prevent anyone or anything from entering your network. Although a firewall protects your trusted networks from unauthorized access, you need a sophisticated security system to protect your computers from threats that are already in the system. An antivirus is a software program that detects and eliminates those threats that might compromise the security of your system or network. Antivirus is a software or set of programs designed to safeguard your system from viruses and worms, Trojan horses, spyware, malware, or anything suspicious that might put your computer at risk. It’s a software program originally designed to detect, prevent, and remove viruses from a computer, hence the name. Even the emails you receive on a daily basis are not completely secure, especially the attachments received along with the emails – they might contain a virus. It finds programs or files or software that might compromise the security of your system by exploiting vulnerabilities in the programs. If and when a virus is detected, the antivirus software employs a variety of security measures such as quarantine, fix, or permanent removal to protect the system. Both firewall and antivirus are security mechanisms designed to protect your system. A firewall is a low-level network security system designed to protect your system and network from malicious mischief. It protects both public and private networks from security threats. Antivirus, on the other hand, is a software utility program designed to safeguard your computer from internal threats such as viruses, malware, spyware, etc. Firewall can also be referred to as a “packet filter”. It acts as a barrier between your computer and the network by monitoring incoming and outgoing traffic and analyzing the data packets that travel along the network. Basically it filters the packets before sending it through or else if found suspicious, it discards the packets. Antivirus is a set of programs designed to find vulnerabilities in your system and take necessary action. The purpose of a firewall is to restrict any unauthorized access into the system by monitoring network traffic in and out of the system. It inspects the data flow from the internet to the system in order to decide which one should be allowed and which one should be restricted. The Purpose of an antivirus program is to detect, scan, prevent, and remove harmful programs that might compromise your computer. A firewall usually works at the network protocol level to safeguard both public and private networks from unwanted intrusion. Setting up a firewall has its advantages, but it has its downsides too. It can only prevent unauthorized access between computer networks based on a pre-defined set of network protocols. Antivirus, on the other hand, works at the file level meaning the software program will only scan for harmful programs that are installed on your system such as worms, Trojans, adware, spyware, malware, rootkits, keyloggers, etc. While it may suggest both firewalls and antivirus programs are based on the same concept, that is recognition, but with different implementations. They both have distinct detection capabilities to unravel hidden vulnerabilities within the system or across the network. A firewall acts as a barrier between the system and the network, whereas antivirus is a software program designed to detect and eliminate viruses, malware, Trojans, spyware, rootkits, and keyloggers from the system. In simple terms, firewall safeguards your system from unauthorized access while it is connected to the internet by monitoring and filtering the incoming and outgoing data. 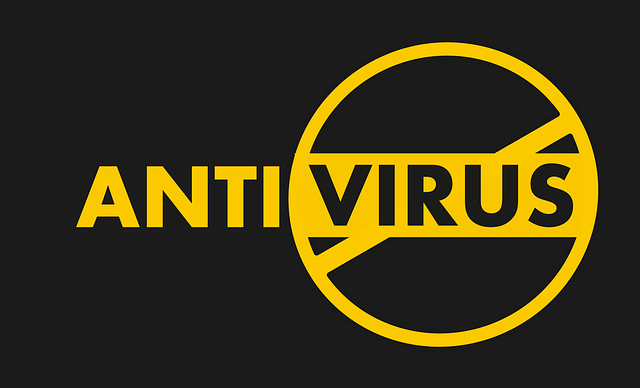 Antivirus is a software utility designed to restrict viruses from entering the system. Sagar Khillar. "Difference Between Firewall and Antivirus." DifferenceBetween.net. 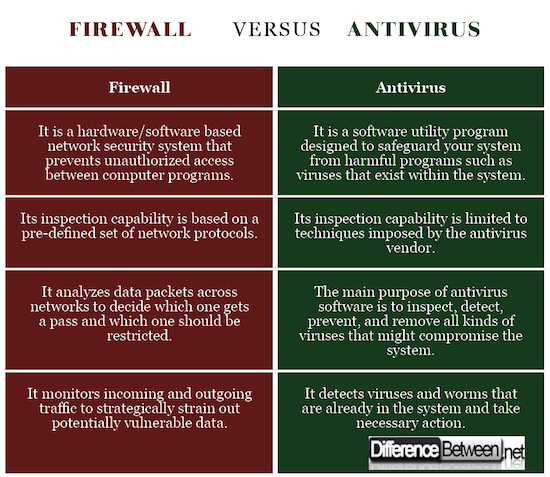 July 16, 2018 < http://www.differencebetween.net/technology/difference-between-firewall-and-antivirus/ >.